Prior to National Fistula Day, a one-week surgical treatment camp was set up with the sponsorship of UNFPA and EngenderHealth at Mbarara Hospital, which treated over 40 women. A series of activities were also conducted by several partners of the Ministry of Health. TERREWODE’s unique contribution was in the area of equipping fistula survivors to utilize the day’s space to inform and advocate for their sexual and reproductive health rights. The organization conducted social reintegration empowerment training for 15 survivors from western Uganda sub-region in preparation for the day. The beneficiaries participated in a one-week training that took place at TERREWODE’s Women’s Empowerment and Economic Self-reliance (WEES) Center. The training focused on counseling, obstetric fistula and human rights sensitization and training in Music, Dance and Drama (MDD). In collaboration with Medical Teams International, TERREWODE also facilitated the survivors’ participation in the day’s events in Mbarara. The skills these women learned during the capacity building retreat were showcased through songs, cultural dances and two personal testimonies at National Fistula Day. This provided a platform for women to both further their own path towards healing by sharing their experiences and raise awareness about fistula in the community. The MDD contained powerful awareness and advocacy messages. For example, survivors used the medium of MDD to urge family members to support women with fistula instead of rejecting them. They also used MDD to call for governmental support in improving access to resources like roads and staffed health facilities to improve the quality of fistula care in Uganda. The performances captivated the audience and compelled governmental authorities to renew their commitment to the campaign to end fistula. For instance, State Minister for Health Hon. Sarah Opendi was so moved by one survivor’s testimony about her persistent incontinence despite having had several surgeries, that she pledged governmental support to pay for the woman’s travel expenses to receive the surgical treatment she needs abroad. Additionally, Resident District Commissioner Kabuye Nickson found the performances and testimonies so powerful that he asked audience members to make financial donations to support the needs of the same survivor. Hon. Sarah Opendi, State Minister for Health (middle) visits TERREWODE’s exhibition stall with TERREWODE’s Executive Director, Alice Emasu (left) to see products produced by fistula survivors and learn about the efforts TERREWODE is currently taking to help eliminate obstetric fistula in Uganda. 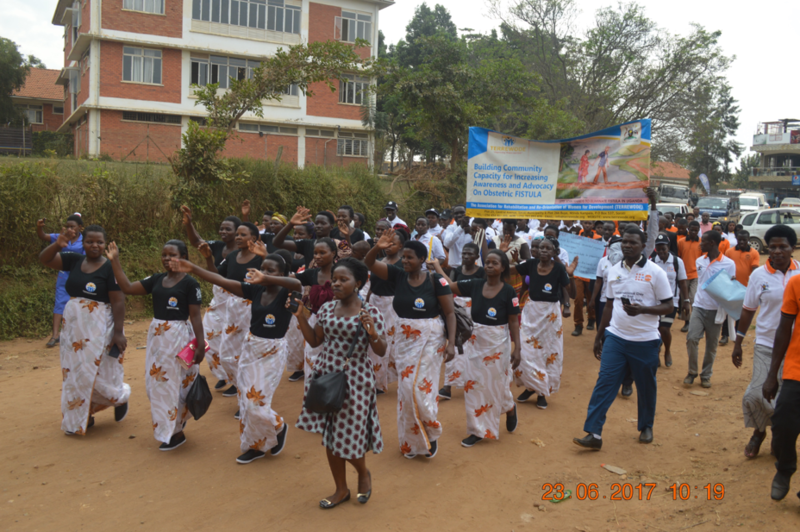 Other activities throughout the day included a procession led by a brass band and fistula survivors, during which participants marched through Mbarara town to raise awareness about obstetric fistula and promote mobilization of those currently suffering from the devastating birth injury. 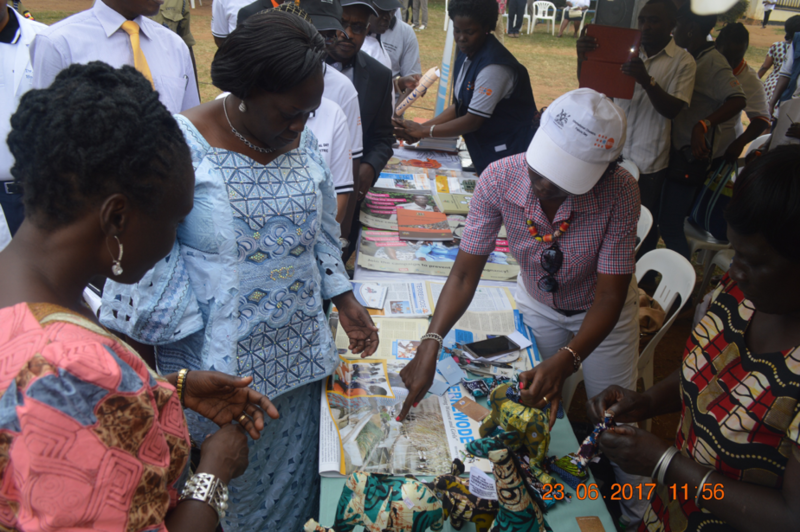 The march finished at numerous exhibition stalls, which showcased the work that partners are currently doing to further the fight against fistula in Uganda. These exhibitions included educational materials from WorldVision, teaching aids from EngenderHealth and numerous products produced by survivors who have been socially reintegrated by TERREWODE. The day provided TERREWODE with an opportunity to kick-start its scaling-up of activities in western Uganda. It also provided community members, stakeholders and fistula survivor’s alike with an opportunity to reaffirm their commitment to ending obstetric fistula once and for all.